In the 1950s, the original VARA studio, designed by Eibink & Snellebrand in 1930-1932, was enlarged in three stages by Piet Elling. The original studio was provided with additional studio space plus a double-height entrance hall and a technical wing on Heuvellaan. Set at right angles to these extensions are two still newer wings added separately: one comprising a large studio, the other four small ones. A cafeteria acts as a bridge between these two wings. 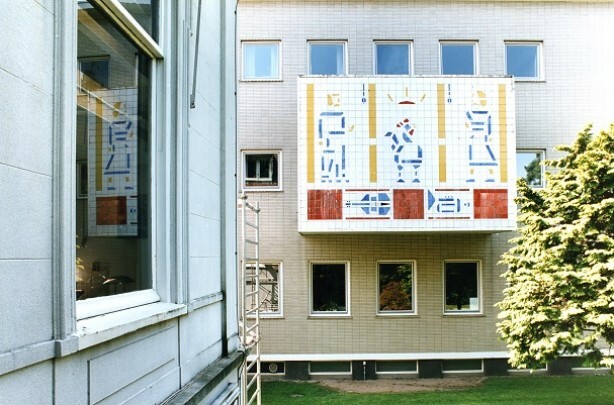 Elling invited his old friend Bart van der Leck to design a tile mural on the outer wall of the technical wing to mark the enlarged main broadcasting studio. The mural, whose tiles are in primary colours and broken white, was only executed and put in place after Van der Leck’s death in 1958. Two figures, a man (left) and a woman, sing into an overhead mike. The central panel is emblazoned with the symbols of this worker’s broadcasting organization: a crowing rooster and a rising sun. In the red band below are depictions of a violin and a trumpet. In 2000 the VARA broadcasting company moved house to a new building in the Media Park. One of the studios is now a concert hall.